Bone meal is a wonderful natural fertilizer that has been used by farmers and gardeners for centuries to improve root growth and flowering in plants. It is the premier source of phosphorus for use in organic gardening and is made from ground-up bones (either cooked or steamed). It can be applied to the overall garden at the time of initial soil prep in the spring, or can be sprinkled in the hole when transplanting starts or perennials to encourage the development of new roots. 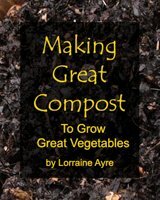 Even though this is a vegetable gardening website, the main way I use this organic fertilizer in my garden is on my flowers, especially if I am transplanting newly-purchased perennials into my flowerbeds. I use a bit in the fall, too, when I put in new bulbs. Bone meal is not taken up directly by plants, but is first digested by soil microorganisms, which act as intermediaries between the soil and the plant, delivering to them just the amount of phosphorus they need. This is one reason why compost is so very important - it's not just supplying nutrients - it supplies the billions of microorganisms that plants need to make the nutrients available. It’s a symbiosis thing. This is also why it is more challenging to grow an organic garden in pots or raised beds that are filled with storebought potting soil. Most potting soil has very few beneficial soil microorganisms in it, which are the plants’ friends and allies. Most plants do not need a lot of phosphorus, but the little bit they do need is critical. Some other mineral deficiencies, as well as pH or water issues, may cause similar symptoms, so the best way to determine if your soil needs phosphorus specifically is to do a soil test. I recommend contacting your local State University Extension Service for this. It usually only costs about $20. and will let you know what, if anything, is out of balance in your soil. It'll save you money in the long run by preventing unnecessary fertilization. 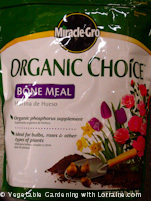 Bone meal is a slower-releasing form of phosphorus fertilizer than “superphosphate” or “triple phosphate", the most popular non-organic forms. It is more stable in the soil, and will not wash away like chemical fertilizers will (which then pollute the groundwater). It will also not “burn” plants, which occurs when chemical fertilizers are too high in concentration and become caustic to the plant tissues, killing them. It is believed by some that bone meal can carry BSE, or “bovine spongiform encephalopathy” - so-called “mad cow disease”. The human version of this disease is called Creutzfeldt-Jakob disease, and three cases of it in Britain developed in people who were rose gardeners and who regularly applied bone meal to their roses. However, in doing deeper research on this, I found two important things: 1) there is no mad cow disease in the US, and 2) the meal in the US is processed in a different way than in Britain. In the US it is processed using both very high temperatures and a chemical solvent, whereas in Britain, they mostly only use heat (or at least they used to). The chemical solvent used in the US kills BSE. 2) wear a mask when you work with serious dust of any kind.